Mercedes C-Class Estate prices announced | What Car? Pricing for the Mercedes C-Class Estate has been announced. It will cost from £28,055 when it goes on sale in September. 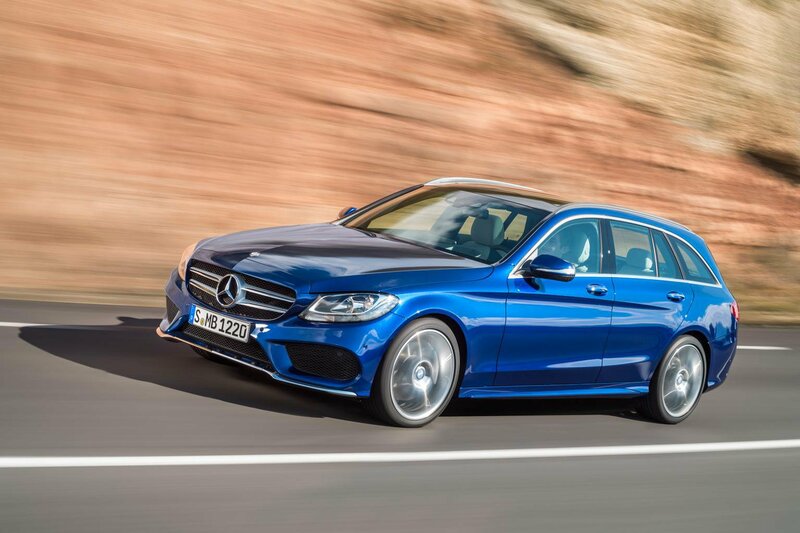 The estate version of the new Mercedes C-Class arrives hot on the heels of the saloon. The C-Class Estate comes with a 490-litre boot, which extends to 1510 litres with the seats folded. These back seats are split 40/20/40. The Estate is almost identical to the saloon version from the front, while it has a more swooping rear roofline than the previous model. The Mercedes' luggage capacity puts it on a par with the BMW 3 Series Touring, but it is slightly larger than the Audi A4 Avant. The 3 Series Touring is as good as it gets in the compact executive estate class, but only if you pick the correct options; it works best when you choose the automatic gearbox and the optional suspension. The Audi, however, has a very firm ride and a poor driving position with offset pedals. The rear seats don't fold totally flat, either. It should prove competitive in terms of running costs, though, and has an impressive set of engines. There will be only three engines when the C-Class Estate goes on sale – a 181bhp C200 petrol that emits 128g/km and averages 51.4mpg, and two diesels: a 168bhp C220 and a 201bhp C250. The C220 diesel is the most efficient in the range, with CO2 emissions of 108g/km and an average fuel economy of 65.7mpg. The C250 emits 117g/km and averages 62.8mpg. The petrol engine and the lower-powered diesel are available with a choice of a six-speed manual and a seven-speed automatic gearbox, while the larger diesel is offered with only the auto 'box. An even more efficient C200 diesel and a C300 Hybrid will join the range later in 2014. The Estate comes with the same basic levels of equipment as the saloon version, with SE, Sport and AMG Line trims on offer. Entry-level SE cars come with 16-inch alloys, manmade leather upholstery, climate and cruise controls, a reversing camera, rain-sensing wipers and a DAB radio. Sport trim gets you 17-inch alloys, flashier interior trim, heated front seats, LED headlights, lower suspension, front and rear parking sensors, sports seats and split-folding rear seats. AMG Line brings 18-inch alloys, an AMG bodykit, a leather-wrapped dashboard, sports suspension and gearshift paddles for the automatic gearbox. There are several option packages to choose from. Executive Package is available only on the SE and costs £995. It adds a Garmin satellite-navigation, heated front seats and changes the colour of the roof rails from black to chrome. The Premium Package costs £1595 and adds a panoramic sunroof, a keyless ignition, ambient lighting and electric seat with memory. The Premium Plus Package also brings a Burmester sound system and the internet-ready Comand infotainment system. It costs £2795. A £1495 Driving Assistance Package is offered on the Sport and AMG Line versions, and adds a blind-spot warning system, lane-keep assist, adaptive cruise control and a pre-safe accident braking system. Buyers will also be able to add a self-levelling suspension system for £895. Every version of the Estate costs £1200 more than the equivalent saloon, with prices starting at £28,055 for the C200 petrol. The C220 starts at £30,565, while the C250 costs from £33,220. The saloon version of the C-Class was launched only recently, but our Target Price team have already managed to find discounts of upwards of £2000 on the new car. On this basis, we would expect similar discounts to be available on the Estate version, so haggle hard.